Union minister J P Nadda on Wednesday exuded confidence that the BJP will win 74 Lok Sabha seats out of 80 in Uttar Pradesh and downplayed the SP-BSP alliance in the state for the general elections. At a meeting with senior office bearers of the party here, Nadda, who is on his first visit to the Uttar Pradesh capital after being appointed the BJP's election in-charge for the state, said the party will register a handsome win in the Lok Sabha polls and all records will be broken. "We shall increase our tally of Lok Sabha seats from the state by winning 74 seats, one more than last time," he told reporters later. In the 2014 general elections, the BJP had won 71 Lok Sabha seats in the state and two other went to its ally - the Apna Dal. Asked about the party's strategy for the polls this time, Nadda said, "Strategy is not meant to be disclosed and will be unveiled at the battleground only." "The people of Uttar Pradesh and the country will shower tremendous blessings on the BJP and their will be an all-time record victory. Not 73, but our tally will be 74 seats (in UP)." "The reasons for this is the inclination and affection of the people towards Prime Minister Narendra Modi and the various welfare works done by the Central government in the past four-and-half years. Apart from this, BJP president Amit Shah's strategy will also lead us to victory," Nadda said. He asserted that the party's electoral plank will be that of development and not caste-based politics. Asked whether there is any threat from the newly-forged SP-BSP alliance, Nadda said, "We knew that this (SP-BSP alliance) is going to happen, and this is a recognition of the BJP. The strength of the BJP itself speaks about it." "Our strategy is to get more than 50 per cent of the votes and that is how we are moving...We were anticipating that this is going to happen, and this shows the strength of the BJP." On allegations by rival political parties that the BJP has been unable to fulfil its poll promises, Nadda said, "As far as Mayawati and Akhilesh are concerned, they are giving their own records. Statistics are clear, and we are ready to discuss it on any forum along with statistics. "Their life and political culture has been of commission, corruption, lawlessness and division. They are presenting their own report card, and we should understand this. The BJP believes in Sabkaa Saath, Sabkaa Vikaas." On various caste conferences organised by the BJP, Nadda said the BJP's poll plank is development and the way to take the country forward. "We represent all the sections of the society... Our responsibility is to reach out to all the sections of the society and it is an essential aspect for us. But, our aim is not to contest elections on the basis of caste or encourage casteist feelings," the Union minister said. Asked to comment on the losses suffered by the BJP in the recent bypolls in the state Nadda said, "We have all the (magic) lamps (of Alladdin)... As our party president said 'Elections is not Physics, it is Chemistry'. Under this Chemistry, the people of the country will shower their blessings on the BJP and Modiji." Nadda asserted that the allies are with the BJP. "There is no bickering (in the NDA). There is very cordial relations. Sometimes, there may be an issue of understanding, but that has been taken care of," he said when asked to comment on the resentment among the BJP's smaller allies like Apna Dal(S). On a question that the Opposition claiming that there is no Modi-wave this time, Nadda said, "Why are they saying that this is not the case (this time). It is a battle of strategy. Even in 2014, they never agreed, but we did it. The grassroot reality to bring Modiji is much much more. It is a question of our strategy, which will be unfolded." "The strength of Modiji has been recognised by the forging of the alliance. And, this tells that you (rival parties) do not have any thought process, ideology, agenda. The only agenda is to remove Modiji. This will not benefit UP or the country, and we will expose this agenda." 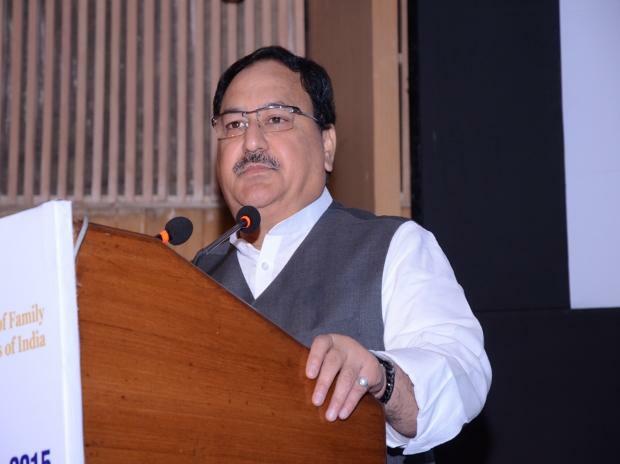 Nadda, who holds the health portfolio, also said that there has been no technical glitches in the implementation of Ayushman Bharat, and the government's endeavour is to stabilise this programme so that it can benefit maximum number of people.